The modern democratic constitutions are characterised by the inclusion of a fundamental rights chapter in their embroys. Implication of such inclusion is that if any of the rights enunciated in the fundamental rights chapter of a particular constitution is infringed than the person likely to be affected by such infringement can have recourse to the court for its realisation. Indeed, such type of protection to some basic human rights like the "right to life" is just praiseworthy. Ours is a constitution baptised by the ocean of blood. So, expectedly it contains a chapter on fundamental rights which embodies 18 fundamental rights. And the very 'right to life' finds an important place among them. In this write-up we would like to have some glimpses on the nature and extent of this right. 'Right to Life' is the first and foremost fundamental right of a human being. It is the right upon which the enjoyment of other rights such as right to fair trial, right to education etc. are dependent. It makes other rights meaningful and enjoyable. Every human being has an inherent 'right to life' which begins since conception [according to Inter-American Convention on Human Rights, 1973] and lasts till death. During this tenure the right can't be taken or hampered except judicially. Convinced by the magnitude of the 'right to life' the constitutions all over the world and the human rights related instruments have placed this right in their wombs. Some provisions regarding this are enumerated hereunder. 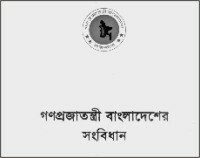 *Article 32 of Banladesh Constitution provides that -- "No Person shall be deprived of life or personal liberty save in accordance with law"
*Article 3 of Universal Declaration of Human Rights Provides --"Everyone has the right to life, liberty and security of person"
*Article 6 of International Covenant on Civil and Political Rights provides -- "Every human being has inherent right to life, This right shall be protected by law. No one shall be arbitrarily deprived of his life." From Bangladesh perspective these three are the core elements dealing with right to life. While article 32 of Bangladesh constitution clothes national protection of other two instruments namely. UDHR and ICCPR accords international and Universal recognition to this right. However, 'right to life' signifies right not to be killed arbitrarily i.e without any lawful authority. Perceived by this notion 'right to life' prohibits all kinds of extra judical killings and at the same time commands that the 'taking away' of a life should be strictly confirmed by the law applicable. So, it also relates this right to other rights such as right to fair trial, right to have legal protection etc. Hence, it is not a single right but a collection of some rights and only then it become enforceable otherwise not. In broader sense. It does not mean only right to live or not to be killed rather, it implies right to lead a decent life. Such trend upholds the recent attitude of judiciary all over the world in explaining or dealing with 'right to life'. Judiciary, by dint of judicial activisim, a potent weapon in its hand, devised such concept. In such cases, in explaining a provision of the constitution the judges not only look to the statute but also to the true intent i.e. the judges follow purpose theory of interpretation -- a departure from the classical literal interpretation of statue. Surprisingly, this method of interpretation is gaining momentum in countries like UK, India, Bangladesh, Sri Lanka etc. Linking various economic, social and cultural rights such as right to education, right to adequate housing, etc. 'right to life' is a glaring example of such explanation. For example in Bangladesh in the famous case of Dr. Mohiuddin Farooque vs. State [49 DLR (AD) (1997] the court held that right to life not only means right to stay alive but to lead a meaningful life with minimum food, housing, education... etc. In India, a lot of cases show such instances. Probably, the most bold one was made in Olga Tellvs Bombay Municipal Corporation [AIR 1986 Sc 180 (1985) 3 SCC 454]. In this case the supreme court held, "The sweep of the right to life conferred by article 21 is wide and far-reaching. It does not mean merely that life cannot be extinguished or taken away as, for example, by the imposition of the death sentence, except according to procedure estaslished by law. That is but one aspect of right to life. An equally important facet of the right is the right to livelihood because, no person can live without the means of living, that is the means of livelhood......." So, the judgement linked right to livelihood with right to life. In Sri Lnaka also, the court, while dealing with right to housing, linked this right with right to life. Broader concept of 'right to life' comes from the explanation of judges of higher court. So, in the implementation of this concept it is activism of judges that should pioneer. Judges can direct the government to implement the 'minimum core' of rights such as right to food, housing etc. which are inextricably linked with 'right to life'. The judgment may be clear-cut to hold government to take steps to perform a specific duty. For instance, in 2001, in reply to a writ petition, the Supreme Court of Inida ordered, the state govt. should implement the mid-day meal scheme by providing every child in every government or governmental assisted primary schools with a prepared mid-day meal with minimum content of 300 calories and 8-18 grams of protein each day of school for a minimum of 200 days. We are, in Bangladesh, also waiting for such pro-people judgment from our learned judges so that the distressed, the dilapidated and the down-trodden may exercise their right to life not merely in the sense of staying alive but also in the sense of being provided with the minimum sustenance to stay alive.